This is a guest post from Prof Wim Alberts. All trade mark lawyers are familiar with the first principles regarding the registration of colour marks – the most basic being, it is difficult. Yes, we do have the pink stuff in the ceiling, the particular shade of green and yellow of agricultural implements which we hold dear, we also have the various conflicts regarding the colour purple for chocolate products, the colour purple for inhalers - Glaxo Wellcome v Sandoz  EWHC 3196 here - the difficulty of how to represent the particular colour(s), the registrability of single colours and acquired distinctiveness etc (see the decision of the then European Court of Justice in Libertel Groep BV v Benelux-Merkenbureau Case C-104/01, dated 6 May 2003 here). So, about a single very plain colour - is it distinctive? This was the first dilemma faced, over time, by the well-known designer Christian Louboutin in the process of enforcing the rights in his red sole trade mark. A happy outcome in the United States was the decision here in Christian Louboutin S.A. v Yves Saint Laurent America Inc., No. 11-3303 (2d Cir. 2012) 1 ‘…the Red Sole Mark has acquired limited secondary meaning as a distinctive symbol that identifies the Louboutin brand, and…it is therefore a valid and protectable mark…’ (page 25) here. A second problem featured in the recent decision of the Court of Justice of the European Union in Christian Louboutin v Van Haren Schoenen BV (Case C‑163/16, dated 12 June 2018) here. This ruling is discussed below. At issue was the following legislative provision, being Directive 2008/95/EC of the European Parliament and of the Council of 22 October 2008 to approximate the laws of the Member States relating to trade marks here. ‘The mark consists of the colour red (Pantone 18‑1663TP) applied to the sole of a shoe as shown (the contour of the shoe is not part of the trade mark but is intended to show the positioning of the mark)’. In terms of a later amendment, the mark was amended in such a way as to limit the goods covered to ‘High-heeled shoes (other than orthopaedic shoes)’. An opponent attacked the mark on grounds in the Benelux Convention, similar to article 3(1)(e) above. It was stated that the mark is a two-dimensional figurative mark that consists of a red coloured surface. 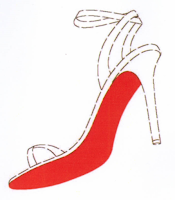 A specific question was referred to the court, interpreted by it as being whether article 3(1)(e)(iii) means that a sign consisting of a colour applied to the sole of a high-heeled shoe, such as that at issue in the main proceedings, consists exclusively of a ‘shape’, within the meaning of that provision. It was said by the court (paragraph 21) that the concept of ‘shape’ is usually understood as a set of lines or contours that outline the product concerned. Further, it does not follow that a colour per se, without an outline, may constitute a ‘shape’. It was added that in any event, a sign, such as that at issue in the main proceedings, cannot be regarded as consisting ‘exclusively’ of a shape, where, as in the present instance, the main element of that sign is a specific colour designated by an internationally recognised identification code. The court then concluded that a sign consisting of a colour applied to the sole of a high-heeled shoe, such as that at issue in the main proceedings, does not consist exclusively of a ‘shape’, within the meaning of article 3(1)(e)(iii). It might not be putting it too strong to simply say that rational thought prevailed in this long-running dispute. After all, a colour is fundamentally different from a shape, doctrinally and practically. The shape issue was substantially a red herring. The use of a red sole on a shoe that is wholly red, can thus not be prevented. Are other restrictions possible? It is well known that little girls are fond of wearing high-heeled shoes – albeit for short distances! Now it seems that Mr Louboutin might himself be taking baby steps, as he plans to extend his red sole range to baby shoes. It would be interesting to follow the possible search, if any, for trade mark protection for these ‘flat’ shoes, entitled the ‘Loubibaby collection’. They might be similar goods in a sense, but the restriction of the specifications to high-heeled shoes is probably fatal. What about the Pantone number? Would the use of a darker red or maroon or slightly lighter red colour infringe? Would the colour depletion doctrine feature here? It would seem that other shades of red can still infringe having regard, for instance, to the wording of section 34(1)(a) of the Trade Marks Act 194 of 1993, which refers to ‘…an identical mark or…a mark so nearly resembling it as to be likely to deceive or cause confusion…’. That would be the test for ‘off-colour’ marks. In conclusion, the tale of the journey for the achievement of trade mark protection for a mere red shoe sole (surprising to non-fashion experts) is perhaps best described by the famous statement of Ripley’s: ‘Believe it or not’!